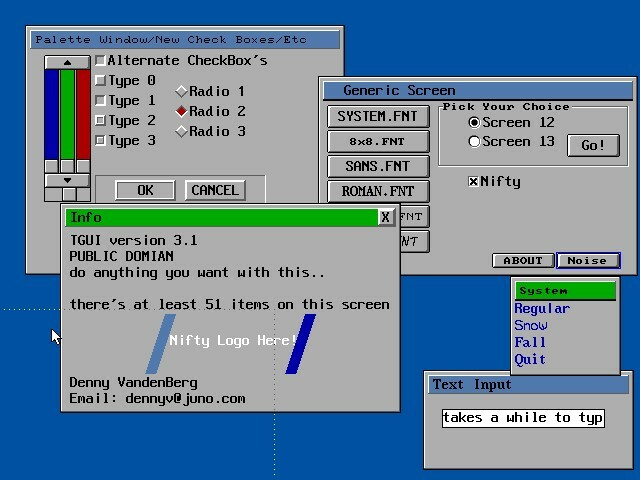 TGUI 3.1 is an amazing GUI especially for its time. Windows can be dragged and dropped, there are multiple types of widgets which are implemented (radio buttons, buttons, labels using fonts, scroll bars, check boxes, and minor graphics). The GUI's performance is very amazing and even makes use of the 16-color palette for SCREEN 12. There's an option to switch between SCREEN 12 and SCREEN 13 if you desire while running the GUI. The code is based around storing information in a giant array based on a structure called "tguitype" which contains information on almost every possible widget set inside the GUI. So if you created a button, you would utilize coordinates, text, and that's about it. Other fields would be left empty and only used when a widget requires them. This is somewhat of a wasteful storage practice. The windows are decent however dragging one or selecting one causes all windows to be redrawn which, on a slow computer, would take a long time. In the end, TGUI 3.1 has a lot of interesting techniques and could prove to be helpful for beginners. The code's a little messy (as the author says) but the concepts are well versed throughout the code.